the fundamental laws of light, electricity and magnetism - and in doing so he provided the tools to create the technological age, from radar to radio and televisions to mobile phones. He is credited with fundamentally changing our view of reality, so much so that Albert Einstein said, “One scientific epoch ended and another began with James Clerk Maxwell”. But who was James Clerk Maxwell? What were his ideas, and does this nineteenth century ‘natural philosopher’ deserve a place alongside Newton and Einstein in the pantheon of science? With Simon Schaffer, Reader in History and Philosophy of Science at the University of Cambridge; Peter Harman, Professor of the History of Science at Lancaster University and editor of The Scientific Letters and Papers of James Clerk Maxwell; Joanna Haigh, Professor of Atmospheric Physics at Imperial College London. 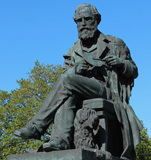 Dr Susie Mitchell (Programme Director at Glasgow City of Science) hears the story of the 19th Century Scottish scientist James Clerk Maxwell. Maxwell's lifelong curiosity about the world and his gift for solving complicated puzzles led him to a string of discoveries. He was the first person to demonstrate a way of taking colour photographs, and he used mathematics to work out what the rings of Saturn were made of before any telescope or spacecraft was able to observe them close up. His most important achievement however was the discovery of electromagnetism, as neatly described by four now famous lines of equations. His prediction of electromagnetic waves led on to a huge range of today’s technology, from mobile phones and wi-fi equipment to radio, X-rays and microwave ovens. Albert Einstein considered him a genius, and another scientist Heinrich Hertz described him as ‘Maestro Maxwell’. The 2015 International Year of Light celebrates, amongst other events, the anniversary of his ground-breaking publication about electromagnetism. So the only question is - how come the name James Clerk Maxwell isn't better known? Part of the “Scots Who Changed the World ” series for Scottish Schools 2nd Level in which Dr Susie Mitchell explores the lives and work of Scottish scientists. (Shares some of the material from the programme above). 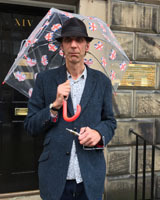 Will Self embarks on a road trip from Edinburgh to Cambridge on the trail of Scottish physicist James Clerk Maxwell who 150 years ago pioneered the theory of the electromagnetic waves which made mobile phones, radio, radar and GPS all possible. In a bid to understand Maxwell and his achievements, Will plans to drive 600 miles in an electric car, stopping off at locations relevant to the much neglected 19th century physicist. 150 years ago, Maxwell proposed his theory of electromagnetism. It allows us to enjoy radio, television, mobile phones and more. So why are so few people familiar with his achievements? For video material please see our Documentary Video page.